The Falklands War was fought between Argentina and the United Kingdom over the sovereignty of the Falkland Islands. It was sparked by the invasion and occupation of these islands by Argentine troops on 2nd April 1982. A United Nations resolution calling for Argentina to withdraw was ignored. This led to armed conflict. More than 1,000 British and Argentine service personnel and civilians lost their lives in the conflict before the islands were returned to British control. 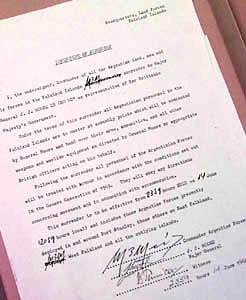 The document shown here is the Instrument of Surrender dated 14 June 1982. It sets out the immediate practical steps to be followed by the Argentine military to implement the surrender. The amendment was made by Major General JJ Moore.